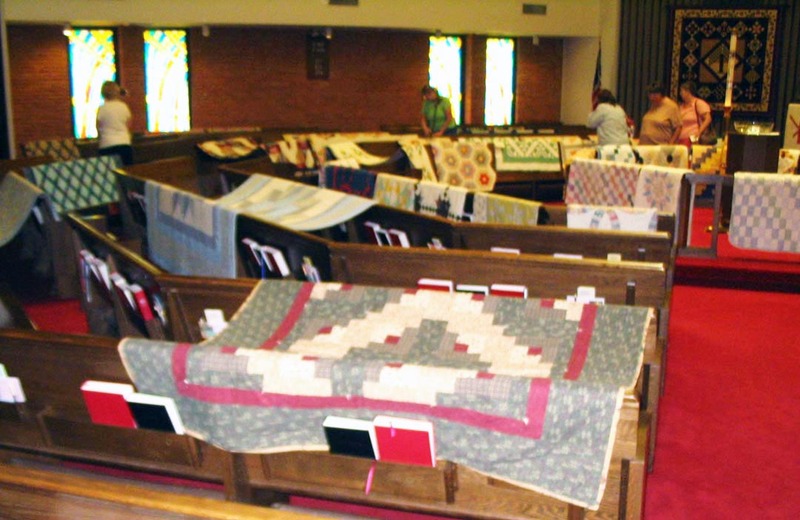 With the quiet backdrop of stained glass church windows, over 120 antique, contemporary and art quilts were gathered together and exhibited this past Saturday in a local Quilt Show at the Trinity Lutheran Church in Hixson, TN. Donations collected at the show will benefit hunger relief efforts for Hamilton County and surrounding communities. 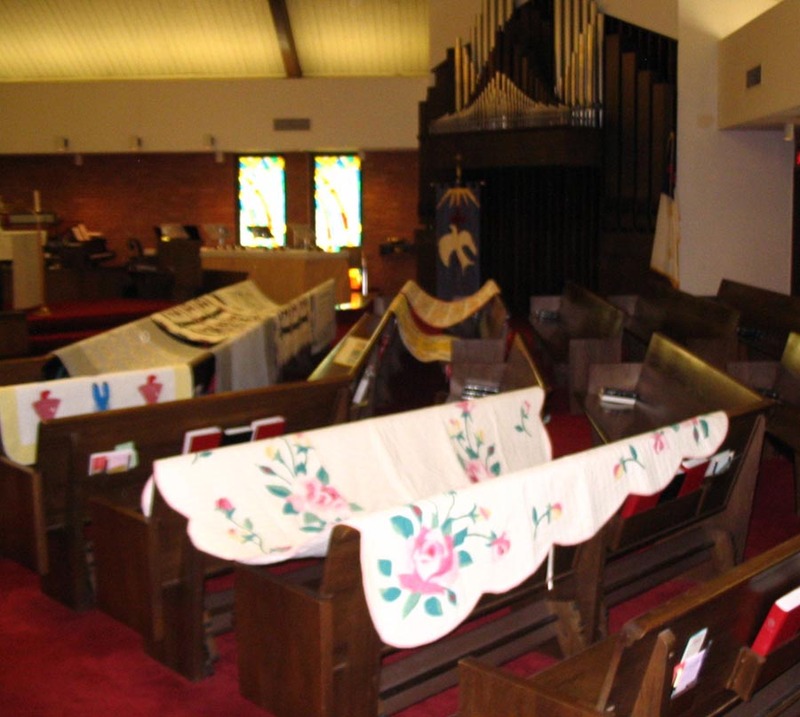 In the midst of the serene reverence of the sanctuary, antique quilts from early- to mid-20th century draped the pews and railings. Sun Bonnet Sue, Log Cabin, and Grandmother's Flower Garden were among the patterns of pieced and appliquéd quilts lying contently beside the hymnals and prayer books tucked in church pew cubbies. Left: many modern day quilts were on display. Right: King size bed quilt showcase a collection of T-shirts. 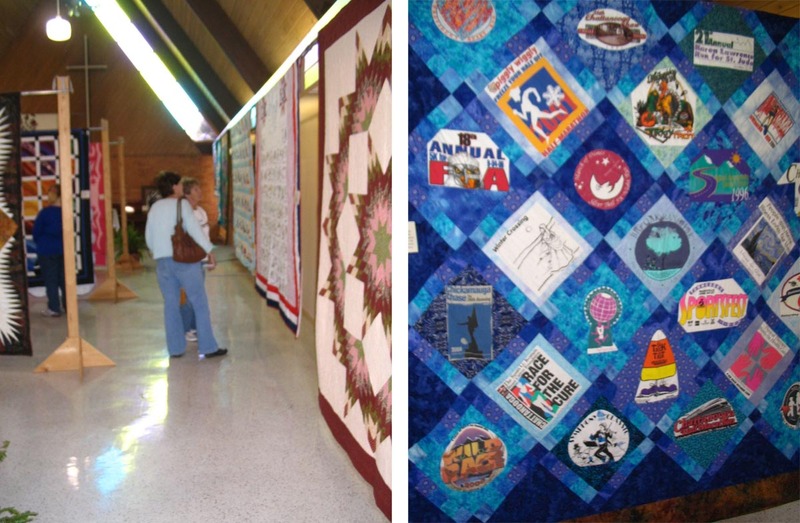 Modern quilts from the 1980s and 90s hung in entryways and were displayed in other rooms along with art quilts and other quilts made in the first decade of the 21st century. 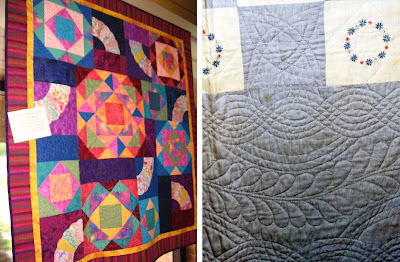 Left: hand quilted appliqué quilt. Right: contemporary log cabin quilt. Examples of stunning hand quilting and machine quilting hung side by side. 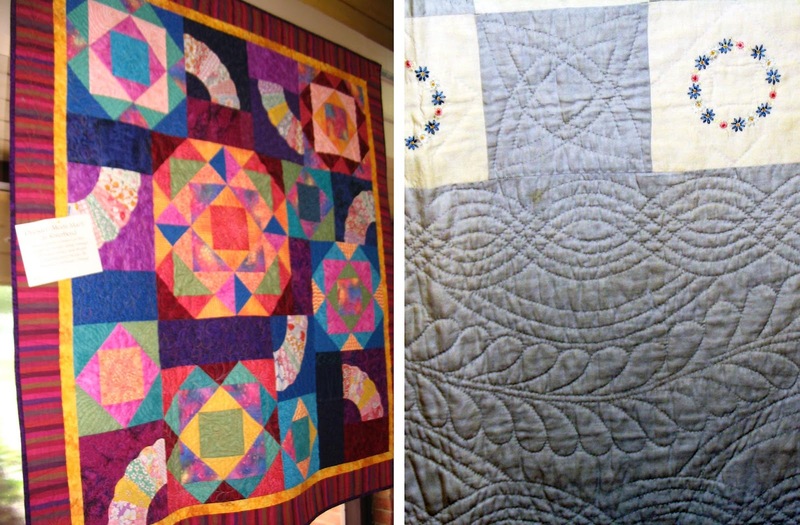 Left: A mix of vintage quilts blocks and contemporary pieced blocks, machine quilted. Right: hand quilted chains and feathers. 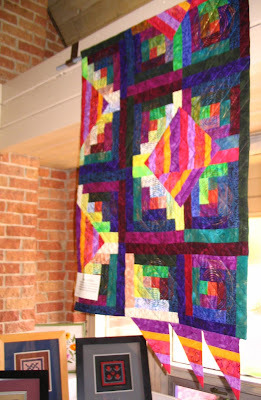 Each quilt in the show had a typed label with the name of the quilt, the name of the quiltmaker, and a descriptive story about the quilt. Here (right), a contemporary, quilted wall hanging is seen beside a collection of framed miniature machine pieced quilts. The miniatures have pieces as small as 1/4 and 1/8 of an inch. 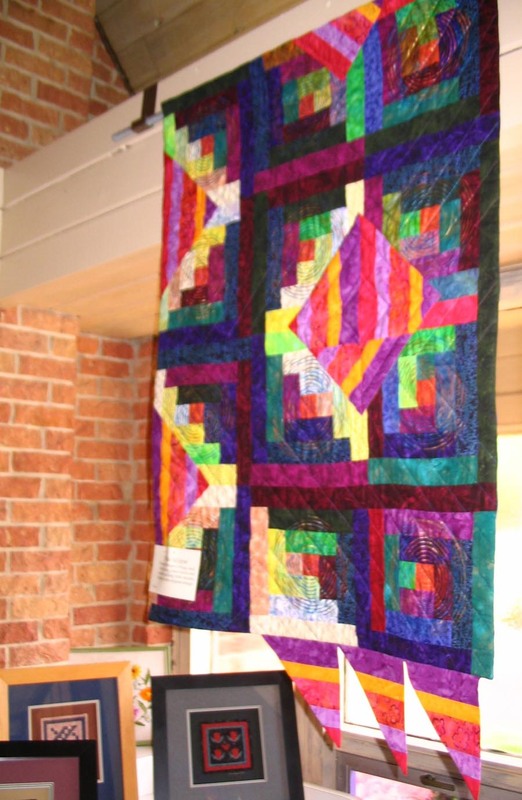 Three fundraiser "Opportunity Quilts" were also on display. 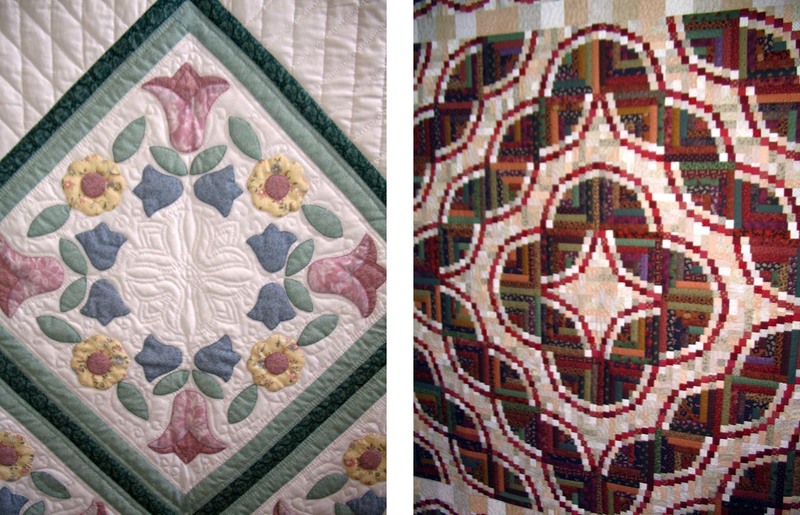 These quilts were comprised of a donated collection of unfinished quilt blocks and fabrics from the estate of a local woman. 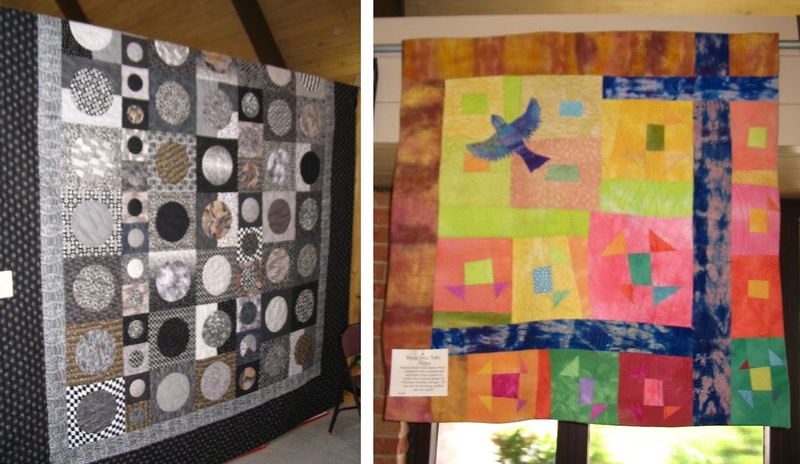 These bits and pieces were combined with fabrics from personal fabric stashes, then pieced and quilted by members of Trinity Lutheran— a creative and collaborative community effort resulting in three beautiful bed-sized quilts. I am especially proud to say that several of my Beginning Quilting students submitted their first Churn Dash quilt that they completed in my class! I know they are as proud of their accomplishments as I am of them, and I'm glad they had the opportunity to share their beautiful work with the community. The team of organizers accomplished no small feat in planning, coordinating and putting on this show! For a first time event, I can say that the entry process was easy and thoroughly documented and the show was very professionally exhibited. Well done, Ginny, Penny, Kathy, Sandy and your team! Thank you for these beautiful photo's. I was unable to attend but saw how hard the team worked to put this beautiful exhibit together.